Accommodation is being managed by ‘Marketing Edinburgh’ and they have reserved a variety of accommodation close to the venue to suit a number of budgets. To view the available hotels and to book please click here. All rates include full Scottish breakfast and VAT unless otherwise stated. 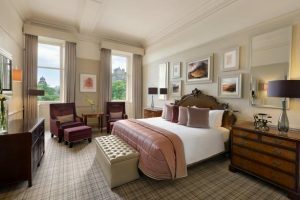 The Waldorf Astoria Edinburgh - The Caledonian is a stunning and luxurious venue, centrally located in the heart of Edinburgh city centre boasting spectacular views of Edinburgh Castle and the Old Town. With 241 rooms, the UK’s first Guerlain Spa, restaurants by Michelin starred Galvin brother’s and Peacock Alley for Afternoon Tea, The Caledonian is a favourite of locals and visitors to the city. Formerly the station concourse and ticket office, Peacock Alley represents the historic heart of The Caley and is imbued with the peerless style and sophistication of this famous former railway hotel. Experience true Waldorf Astoria service with customised planning and world class cuisine from our experienced catering staff with innovative menus, tailored to your requirements. The Roxburghe Hotel is one of the most iconic hotels in Edinburgh and located in the heart of the Georgian New Town overlooking Charlotte Square, home to Scotland's First Minister. 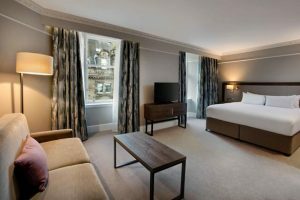 Combined with its historical architecture, the hotel has 199 refurbished bedrooms, many with views of Edinburgh Castle. At DoubleTree by Hilton Edinburgh City Centre, we take your business very personally. Located in the heart of Edinburgh is easily accessible by all major transport links. Enjoy the spectacular backdrop of Edinburgh Castle and the city skyline! Taking prime position on elegant George Street, the Principal Edinburgh has been welcoming hotel guests since 1881. The Principal Edinburgh has been refurbished to splendour by interior architects Goddard Littlefair, creating a sense of restored grandeur by means of sympathetic restoration, simple detailing and the use of rich materials such as oak, brass, leather, velvet, glass and marble. Enjoy stylish bedrooms in soft greens and creams and Scottish heritage finishing touches, dine and drink in the brand new destination restaurant and bar: Printing Press Bar & Kitchen or join us for a great cup of coffee at the new coffee shop: Burr & Co .
An imposing building, standing proudly on North Bridge next to Waverley railway station and overlooking the Royal Mile. 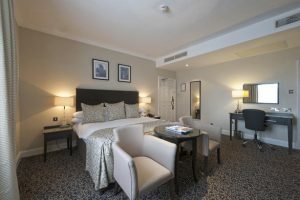 In December 2017 we completed a £18.5M refurbishment which covered all areas of the Hotel including an increase in our number of bedrooms from 189 to 211, the addition of an executive lounge, Marco Pierre White Steakhouse and bar which will certainly cement our standing as one of the most iconic and elegant hotels in Edinburgh...but don't take our word for it....try us yourself! 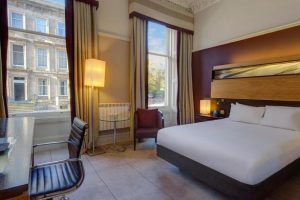 Fraser Suites Edinburgh, is a sumptuous property boasting 75 luxurious rooms and plush apartments, including four stunning bespoke suites, in an enviable location. Ideally located just off the Royal Mile, a stone’s throw from Edinburgh Castle and a short stroll to the famous Princes Street, you couldn’t be more central! As you step through the door into the world of Frasers Hospitality, you will instantly feel welcome and at home. Our friendly and courteous staff will ensure your stay is a memorable one, whether it’s for one night or more. Experience first class hotel services including complimentary fitness suite and city centre shuttle bus (Monday-Friday) which is also available for airport and private charters. Please note that this rate includes Continental Breakfast only. Stay at the Mercure Edinburgh City-Princes Street Hotel above the busy Princes Street shops with views of majestic Edinburgh Castle. Curl up with a Glenfiddich malt whisky in an armchair in the Princes Bar or spoil yourself with traditional afternoon tea whilst catching Edinburgh Castle's ramparts bathed in golden sunlight. 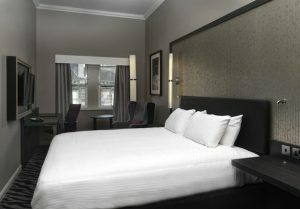 Mercure Edinburgh City Hotel standard rooms have flat-screen TV and internet access. 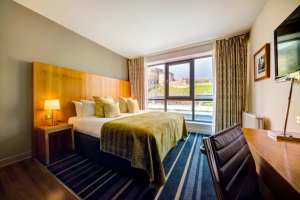 The 4-star Novotel Edinburgh Centre hotel is located in central Edinburgh, close to the Royal Mile, Princes Street and near to Edinburgh Castle. The Hotel is one of the city's leading 4* hotels and we invite you to experience one of our newly refurbished Superior, Executive and Suite rooms. After an active day exploring Edinburgh and its surroundings, take advantage of our heated pool, gym and spa. To kick start your evening, join us at the Tap Kitchen & Bar for a cocktail or craft beer. 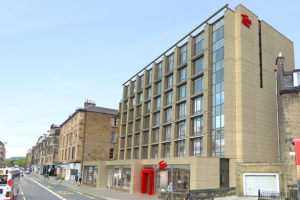 Ibis Edinburgh Centre South Bridge is located in Edinburgh Old Town just off the Royal Mile. 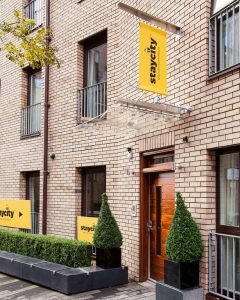 The hotel has 259 modern guest rooms and is within walking distance of the sights and night-life of Edinburgh. The bar serves a selection of beers, wines, spirits as well as light meals and snacks 24 hours a day. 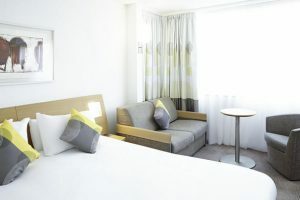 Furnished with our new Sweet Bed by ibis bed and bedding, the new ibis room offers the ultimate in comfort: large double bed, en-suite bathroom, hair-dryer, tea/coffee facilities, desk, internet and LCD flat screen TV with all the best channels. Guests can surf the web using the complimentary wireless high-speed internet connection. 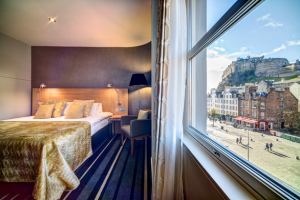 In the heart of Edinburgh's vibrant Grassmarket, Apex Grassmarket Hotel sits tucked below Edinburgh Castle and in the heart of the Old Town. The reputation that this hotel has acquired for style and excellent service attracts loyal guests from around the world. 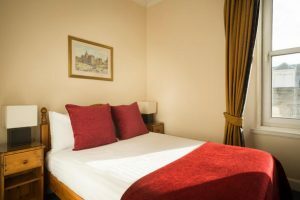 Apex City of Edinburgh Hotel is located in the heart of Edinburgh’s Grassmarket, just minutes away from The Royal Mile and famous Edinburgh Castle. All rooms and suites provide plenty of natural light, comfort, and space. 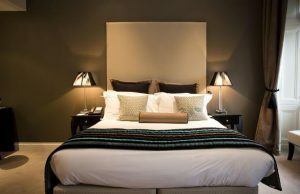 You’ll also find complimentary luxurious Elemis toiletries, a 42” LCD TV and vanity area with hair dryer and mirror in your room. Downstairs, you can relax in Agua Restaurant and Bar. This modern space is set back from the bustling Grassmarket and offers a wide selection of dishes through its all day dining menu including burgers, steaks and pastas. Afterwards, retreat to the lounge and choose from an extensive wine list or sip on an expertly prepared cocktail with Castle views. Nestled into Edinburgh’s charming West End, Hilton Edinburgh Grosvenor is located 200 metres from Haymarket Station offering convenient transport links via train, tram and bus. 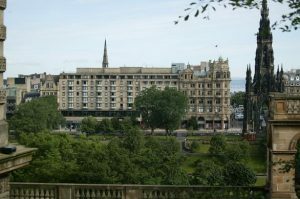 The Edinburgh International Conference Centre (EICC) is less than a 10 minute walk and Murrayfield Stadium is also nearby. Featuring a stylish interior with modern amenities, Hilton Edinburgh Grosvenor is set inside a beautiful historic 1860’s listed building. Perfectly placed in the heart of Edinburgh, this convenient hotel is steeped in history and charm. The Old Town and Grassmarket are literally on your doorstep, and within walking distance you will find Edinburgh Castle and the Royal Mile, Edinburgh International Conference Centre and main financial district, plus the numerous bars and cafes Edinburgh has to offer. 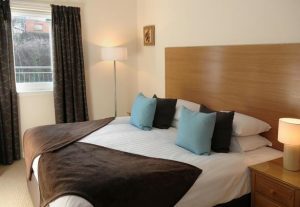 Modern and comfortable guest rooms, free Wi-Fi plus a warm friendly welcome awaits you at Edinburgh City Hotel. 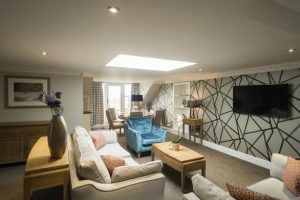 KM Central, formerly known as Kenneth Mackenzie, has undergone a large-scale renovation on its 45 double en-suite bedrooms as well as a re-design of the breakfast room. KM Central is one of Edinburgh First’s year-round hotels in heart of the city. Its compact and contemporary design, means the purposeful rooms use efficient amount of space making for a comfortable stay. 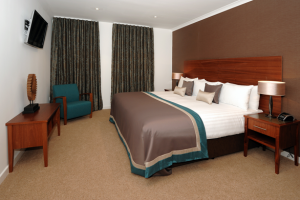 A ‘typical’ room is 13.6sqm, which includes double bed, wardrobe, desk and en-suite – perfect for delegates. 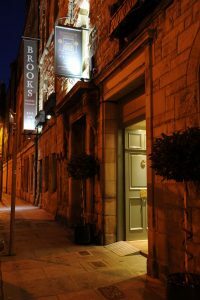 Brooks Hotel Edinburgh is a chic boutique hotel offering luxury b&b at affordable prices. All the bedrooms have new beds with duck down bedding, Cole and Son wallpapers, designer furniture and power showers from Hansgrohe. 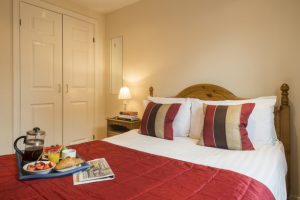 Free WIFI is available in all the bedrooms, A lift is available to all floors. The ground floor has a beautiful open style lounge with honesty bar and separate light airy breakfast room, which has an open style kitchen so you can see our chefs at work. Our breakfast is a delicious full Scottish breakfast using locally sourced ingredients which includes award winning haggis; a continental style breakfast is also available. Sometimes, all you really need from a hotel is a hot shower and a good night's rest. That's why, our limited service hotel offers beds at very affordable prices by getting rid of costly full service extras (pools, spas, saunas, room service or the like) that you just don't need and shouldn't have to pay for. The basis of our promise for a great sleep! 5 star beds, power showers, central and convenient locations, clean environment and 24 hour security with excellent customer service. Please note that breakfast is NOT included in these rates. All apartments have a fully equipped kitchen with tea, coffee, sugar (white and brown), UHT coffee creamers and salt & pepper provided. Each apartment has laundry facilities. Grove Executive Apartments feature 24 luxury one and two bedroom apartments, including 2 stunning Penthouses. 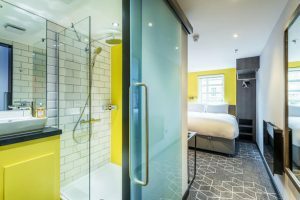 The two bedroom apartments incorporate a separate shower room for each bedroom - perfect for corporate guests. Fountain Court – Royal Garden Apartments are an exciting collection of luxury serviced apartments located in a traditional historic building and immaculately furnished in a contemporary style. Apartments are spacious with comfortable and stylish furnishings, and our two bedroom penthouse apartments feature rooftop balconies with spectacular views over the River Forth and on to Fife in the North. 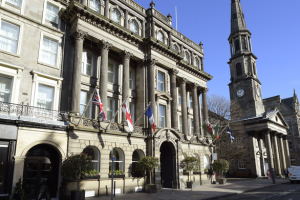 Ideally located opposite the Scottish National Portrait Gallery and St Andrew Square, you can enjoy access to the adjacent private Queen Street Gardens; a haven of scenic relaxation in Edinburgh’s city centre. Stewart Apartments are the newest addition to the Fountain Court portfolio and are located in the heart of Edinburgh's vibrant city centre. The 31 boutique style serviced apartments are located over 3 floor with lift access to all. Each will feature an open plan living room and fully fitted kitchen including dishwasher and washing machine. All are equipped with the latest technology, including a 37 inch HD LED television, blu-ray DVD player and iPod dock, complimentary Wifi internet access, Sky sports and movie channels. 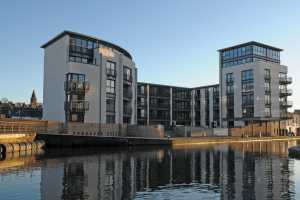 Situated on the banks of the regenerated Union Canal at Fountainbridge, the luxurious 5 star development of EQ2 could not be better placed. Designed in the style of a boutique hotel, these spacious, contemporary one, two and three bedroomed apartments have been elegantly finished with Italian furniture, feature modern entertainment systems, and provide guests with complimentary Fibre Optic Wi-Fi internet access. Opened in March 2016, Fountain Court Apartments - Braid provides guests with a stylish home away from home right in the city centre of Edinburgh. The apartments all have fully fitted kitchens. Hairdryers, irons and ironing board are also provided. Breakfast is not included in the nightly rate but may be purchased in advance. Please see our website for details and costs. In addition, there are many great cafes and restaurants nearby which offer exclusive discounts to our guests. 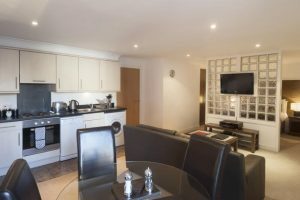 Furthermore, each apartment is equipped with complimentary high speed internet access, Freeview TV and selected satellite channels. 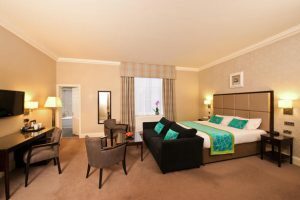 This four star luxury accommodation is situated right in the heart of Edinburgh, the beautiful capital city of Scotland. Designed to our own demanding specifications, you have a choice of one or two bedroom apartments in this luxury four star accommodation, each of which offer a lovely selection of contemporary furniture, including chocolate leather sofas. Naturally, they feature the latest flat screen satellite televisions in the bedrooms and the living room, as well as DVD and CD players, i-Pod connectivity and wireless broadband access. These one and two bedroom apartments on Grove Street offer plenty of space, flexibility and value for money. There are 43 spacious one and two bedroom apartments which include a fully equipped kitchen with microwave, dishwasher and washing machine. Complimentary WI-Fi internet access is offered to guests. Secure car parking on-site is available on request. Morrison Street apartments are the ideal base for one or two people. Bigger, more flexible and more relaxing than a hotel room, these 1 bedroom apartments really do feel like your own home. 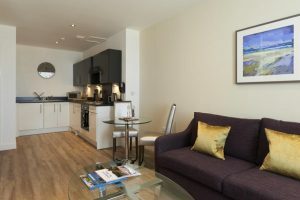 Each apartment is equipped with complimentary broadband, Freeview TV and a CD player. Furnishings and décor are simple and the kitchen is fully equipped with all the appliances you need, including the must have dishwasher! These apartments are serviced daily by our housekeeping team. Please note - there is no lift at this property. 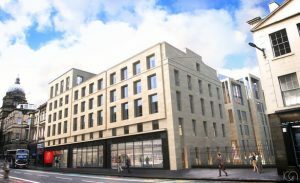 In the heart of the city’s financial district, only five minutes’ walk from the Edinburgh International Conference Centre, this new development of four star serviced apartments is an ideal base whether your stay is for business or pleasure. Providing a genuine home from home all apartments are fully furnished, bed linen and towels are also provided. The apartments have spacious bedrooms, lounge/dining areas, fully equipped kitchens, washer/dryer, microwave oven and LCD TV and DVD players. 24 Hour Reception, complimentary Wifi and secure underground car parking are available. Inclusive of one ‘Grab & Go’ breakfast voucher per 1-bedroom apartment. Voucher includes tea or coffee and a muffin to go from a nearby café.